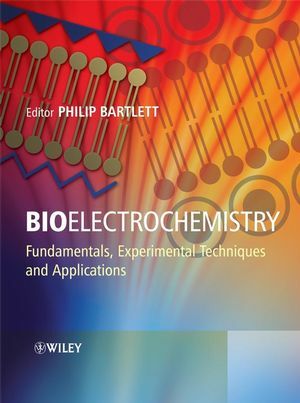 1 Bioenergetics and Biological Electron Transport (Philip N. Bartlett). 1.3.1 The Proton Motive Force. 1.3.2 The Synthesis of ATP. 1.4.2 The NADH–CoQ Reductase Complex. 1.4.3 The Succinate–CoQ Reductase Complex. 1.4.4 The CoQH2–Cyt c Reductase Complex. 1.4.5 The Cyt c Oxidase Complex. 1.4.6 Electron Transport Chains in Bacteria. 1.4.7 Electron Transfer in Photosynthesis. 1.6.3 Kinetics: Electron Transfer Rate Constants. 1.6.5 One-Electron and Two-Electron Couples. 2 Electrochemistry of Redox Enzymes (James F. Rusling, Bingquan Wang and Sei-eok Yun). 2.1.2 Examples of Soluble Mediators. 2.1.3 Development of Protein-Film Voltammetry and Direct Enzyme Electrochemistry. 2.2.2 Wiring with Redox Metallopolymer Hydrogels. 2.2.3 Wiring with Conducting Polymers. 2.2.5 Regeneration of NAD(P)H from NAD(P)þ. 2.2.6 Regeneration of NAD(P)þ from NAD(P)H.
2.3 Direct Electron Transfer between Electrodes and Enzymes. 2.3.2 Enzyme-Film Voltammetry: Basic Theory. 2.3.3 Adsorbed and Coadsorbed Enzyme Monolayers. 2.3.4 Self-Assembled Monolayers and Covalently Attached Enzymes. 2.3.5 Enzymes on Carbon Nanotube Electrodes. 2.3.6 Enzymes in Lipid Bilayer Films. 2.3.7 Polyion Films and Layer-by-Layer Methods. 2.4 Outlook for the Future. 3 Biological Membranes and Membrane Mimics (Tibor Hianik). 3.2 Membrane Structure and Composition. 3.3 Models of Membrane Structure. 3.3.2 Bilayer Lipid Membranes (BLM). 3.3.3 Supported Bilayer Lipid Membranes. 3.4 Ordering, Conformation and Molecular Dynamics of Lipid Bilayers. 3.4.1 Structural Parameters of Lipid Bilayers Measured by X-ray Diffraction. 3.4.3 Dynamics and Order Parameters of Bilayers Determined by EPR and NMR Spectroscopy and by Optical Spectroscopy Methods. 3.5 Phase Transitions of Lipid Bilayers. 3.5.1 Lyotropic and Thermotropic Transitions. 3.5.2 Thermodynamics of Phase Transitions. 3.5.6 Theory of Phase Transitions. 3.6 Mechanical Properties of Lipid Bilayers. 3.6.1 Anisotropy of Mechanical Properties of Lipid Bilayers. 3.6.2 The Model of an Elastic Bilayer. 3.6.3 Mechanical Properties of Lipid Bilayers and Protein–Lipid Interactions. 3.7.3 Methods of Surface Potential Measurement. 3.8.1 The Basic Principles of the Measurement of Dielectric Relaxation. 3.8.2 Application of the Method of Dielectric Relaxation to BLMs and sBLMs. 3.9.2 Facilitated Diffusion of Charged Species Across Membranes. 3.9.3 Mechanisms of Ionic Transport. 3.10 Membrane Receptors and Cell Signaling. 3.10.2 Principles of Hormonal Reception. 3.10.3 Taste and Smell Reception. 3.11.1 Modification of Lipid-Film Coated Electrodes by Functional Macromolecules. 3.11.2 Bioelectrochemical and Analytical Applications of Lipid Coated Electrodes. 4 NAD(P)-Based Biosensors (L. Gorton and P. N. Bartlett). 4.3 Direct Electrochemical Oxidation of NAD(P)H.
4.4.1 Implications of the Low Eo0 Value for Practical Applications. 4.4.2 Special Prerequisites for Biosensors Based on NAD(P)-Dependent Dehydrogenases. 4.5 Mediators for Electrocatalytic NAD(P)H Oxidation. 4.5.1 Other Mediating Functionalities and Metal Coated Electrodes. 4.6 Construction of Biosensors from NAD(P)H-Dependent Dehydrogenases. 4.6.1 Entrapment Behind a Membrane. 4.6.2 Covalent Attachment to a Nylon Net or Membrane. 4.6.4 Entrapment in a Polymer Film. 5 Glucose Biosensors (Josep M. Montornes, Mark S. Vreeke and Ioanis Katakis). 5.1 Introduction to Glucose Sensors. 5.5.3 Inner and Outer Membrane Function. 5.6 From Product Design Requirements to Performance. 5.6.1 Design Exercise for the Disposable Glucose Sensor. 6 Phenolic Biosensors (Ulla Wollenberger, Fred Lisdat, Andreas Rose and Katrin Streffer). 6.2 Enzymes Used for Phenol Biosensors. 6.2.1 Phenol Oxidation by Water-Producing Oxidases and Oxygenases. 6.3 Design of Phenol Biosensors. 6.3.2 Bioelectrocatalysis Based on Phenol-Oxidizing Enzymes. 6.3.3 Electrocatalytic Sensors Based on Quinone-Reducing Enzymes. 7 Whole-Cell Biosensors (H. Shiku, K. Nagamine, T. Kaya, T. Yasukawa and T. Matsue). 7.2 Whole-Cell Biosensors Probing Cellular Functions. 7.2.1 Redox Reactions in Whole Cells. 7.2.2 Responses on a Microbial Chip with Collagen Gel. 7.3 Whole-Cell Microdevices Fabricated Using Bio-MEMS Technologies. 7.3.1 Potentiometric Devices: LAPS and ISFET. 7.3.2 Other Electrochemical Devices: Amperometric and Impedance Sensors. 7.3.3 Improvement of Cell Culture within Microenvironments. 7.4 Genetically Engineered Whole-Cell Microdevices. 7.4.1 Sensors with Gene-Modified Bacteria. 7.4.2 Transcriptional Responses on a Microbial Chip with Collagen Gel. 7.4.3 Cellular Devices for High-Throughput Screening. 7.4.4 Microdevice for On-Chip Transfection and On-Chip Transformation. 8 Modelling Biosensor Responses (P. N. Bartlett, C. S. Toh, E. J. Calvo and V. Flexer). 8.2.2 Analysis of Enzyme Kinetic Data. 8.2.3 The Significance of KMS for Biosensor Applications. 8.3.1 The Flux Diagram for the Membrane|Enzyme|Electrode. 8.3.2 Solving the Coupled Diffusion/Reaction Problem for the Membrane Enzyme|Electrode. 8.3.3 Deriving a Complete Kinetic Model. 8.3.4 Experimental Verification of Approximate Analytical Kinetic Models. 8.5 Modelling Redox Mediated Enzyme Electrodes. 8.5.2 Homogeneous Mediated Enzyme Electrode. 8.6 Modelling Homogeneous Enzyme with Attached Redox Mediator. 8.7 Non-Steady-State Techniques for Homogeneous Enzyme Systems. 8.7.1 Extraction of Kinetic Parameters. 8.8 The Heterogeneous Mediated Mechanism. 8.8.1 Enzyme Monolayers with Soluble Redox Mediator. 9 Bioelectrosynthesis–Electrolysis and Electrodialysis (Derek Pletcher). 9.2.1 Electrolytic Production of Organic Compounds. 9.2.3 Enzymes in Organic Synthesis. 9.2.4 Combining Enzyme Chemistry and Electrosynthesis. 9.3 Mechanisms of and Approaches to Bioelectrosynthesis. 9.4.1 The Oxidation of Alcohols and Diols. 9.4.2 The Oxidation of 4-Alkylphenols. 9.4.3 The Synthesis of Dihydroxyacetone Phosphate. 9.4.4 The Site Specific Oxidation of Sugars. 9.4.5 Hydroxylation of Unactivated C–H Bonds. 9.4.6 Reduction of Carbonyl Compounds. 10 Biofuel Cells (G. Tayhas R. Palmore). 10.2 Fundamentals of Fuel Cells. 10.2.1 How Fuel Cells Work. 10.2.2 Equations that Govern the Performance of a Fuel Cell. 10.3 Economics of Conventional Fuel Cells and Biofuel Cells. 10.4 Biofuel Cells that use Micro-Organisms as the Catalytic Element. 10.5 Biofuel Cells that use Oxidoreductases as the Catalytic Element. 10.6 Future Directions in Biofuel Cell Research. 11 Electrochemical Immunoassays (Julia Yakovleva and Jenny Emneus). 11.2 Basic Concepts in Immunoassay. 11.2.1 Antibodies: Structure, Properties and Production. 11.4 Different Assay Formats and Applications. 11.5 Future Perspectives and Recent Trends. 12 Electrochemical DNA Assays (Ana Maria Oliveira-Brett). 12.3 Adsorption of DNA at Electrode Surfaces. 12.3.2 Adsorbed dsDNA and ssDNA. 12.4 Electrochemistry for Sensing/Probing DNA Interactions. 12.4.1 Biomarkers for DNA Damage. 12.5.1 In Situ DNA Oxidative Damage. 13 In Vivo Applications: Glucose Monitoring, Fuel Cells (P. Vadgama and M. Schoenleber). 13.4.1 Electrode Designs for Tissue Monitoring. 13.4.2 Electrode Designs for Blood Monitoring. 13.4.3 Early Phase Tissue Response.